What Does Mark 2:27 Mean? When God had finished His six days of creation, He rested on the seventh day. 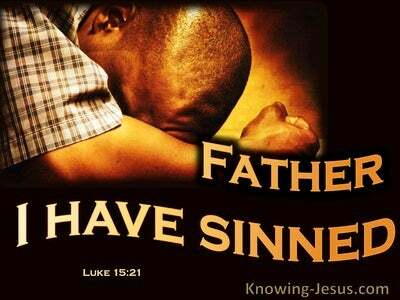 However, due to man’s sin, God had to begin another work – the work of redemption, which is the work that will one day be fully and finally completed when Christ is all in all. God rested after His six days of creation, when His work of creation was done, as a prophetic picture for all. He picked Israel to be His chosen nation and gave them a Sabbath day rest from their earthly labour, as a picture of a future day of rest. Israel’s Sabbath was a weekly reminder, that a Saviour was coming one day, to end their toil and bring them into an eternal day of rest – and it was finally accomplished at the first coming of Christ, for all who would believe. 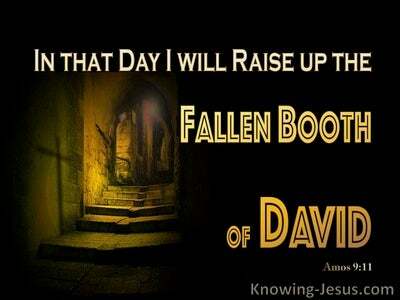 Israel’s Sabbath rest not only pointed back to God’s day of rest, following His work of creation, but also looked forward to that future day of rest – when all earthly toil would be ended, and we will enjoy His eternal ‘day of rest’. When the Lord commanded Israel to remember the Sabbath-Day to keep it holy and charged them take a day of rest following six days of labour, it was not meant to frustrate them and become onerous to them. It was designed to be a time of spiritual refreshment and a sign-post to a future day of rest, when God would wipe away all tears from their eyes and set up His earthly kingdom of peace and prosperity, where everyman would sit under his own vine. However, following years of abuse, where onerous regulations were piled on the people of God, the Jew’s Sabbath became an oppressive burden. The religious leaders had taken and twisted the sabbath law and other commands to lay heavy weights on the necks of the Jewish people. Instead of it being a day of rest and enjoyment, for the good of men’s souls, it became burdensome. Instead of it being a day of divine worship, where body and soul were refreshed, it became a day when even the simplest tasks were sharply condemned. 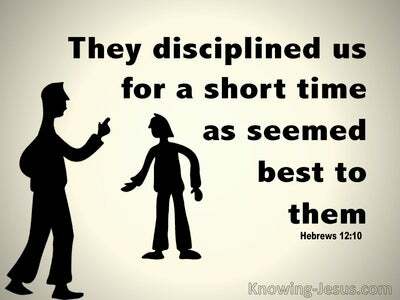 The Sabbath day restrictions which were imposed on the people by the religious leaders had become out of hand and unmanageable over many years of abuse, such that Christ’s disciples were accused of breaking the Sabbath-Day regulations. simply because they plucked a few ears of corn and ate the tiny grains on the Sabbath Day! Legalism had become so entrenched in Jewish culture that Jesus had to firmly reprimand the chief priests and Pharisees by saying, the Sabbath was made for man, and not man for the Sabbath. 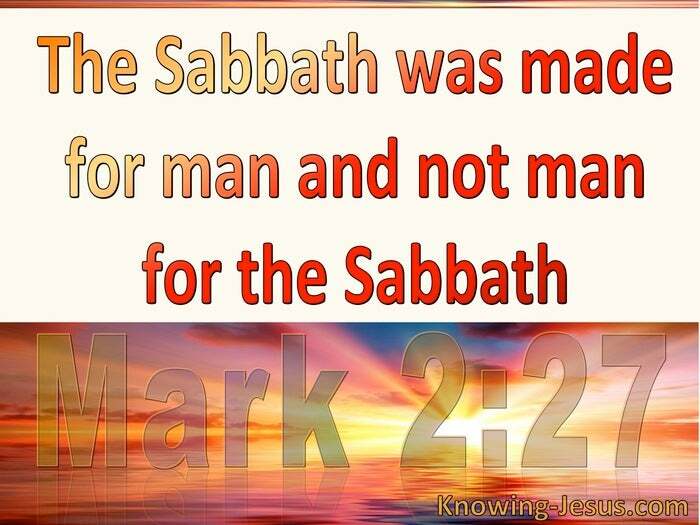 Israel was given the Sabbath Day for their physical benefit and spiritual refreshment, but the legalists of the day had twisted it to become diametrically opposite of God’s original purpose for mankind. The Sabbath was designed to restore and reinvigorate the people after the toil of the previous week’s work. It was given so that they might have a period of leisure in order to meditate on the Scriptures and rejoice in God’s goodness and grace. It was not designed to trip men up but to refresh them. 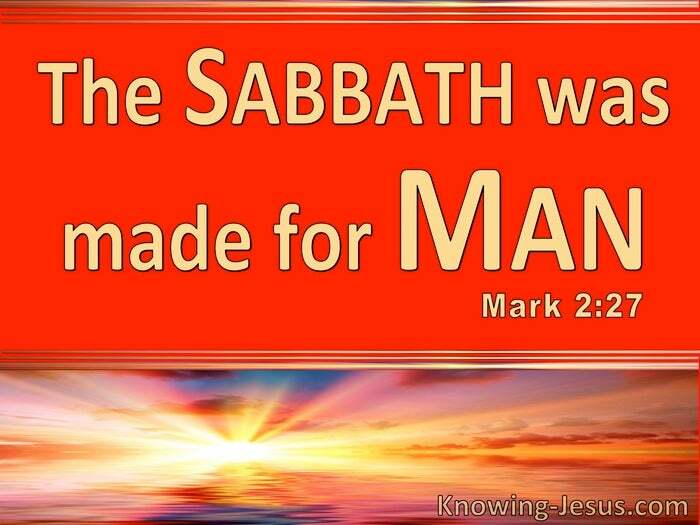 The Sabbath was given for the benefit of man and not the other way around, which is why we read that Jesus said to them, “The Sabbath was made for man, and not man for the Sabbath”. As Christians in the Church age we are issued with many commands, which are to be carried out in spirit and in truth – through the power of the indwelling Holy Spirit. Instructions for the church are found in Paul’s epistles and the writings of the other New Testament apostles, but nowhere are we commanded to keep the Sabbath day as many denominations insist. Indeed the church is instructed not to lay down such restriction and adhere to the traditions of man – many of which are rooted on the Old Testament law given to Israel. Those who choose to do so are at perfect liberty to worship on the Sabbath, and those who choose to worship on a Sunday are also at liberty to do so, but neither are legal requirements for Christians in this church age, and we are not to judge those who DO or those who do NOT. We are saved by grace through faith and expected to adhere to the instructions issued in God’s Word. We are encouraged to meet together for instruction and fellowship – but as believers, Who have trusted Christ for salvation, we have found our rest in HIM. 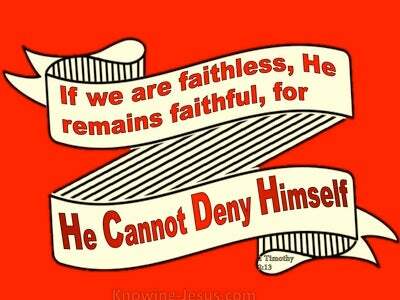 Our relationship with the Father depends on faith and not of the following of rules and regulations. As new creatures in Christ we have already found true rest through our new, regenerated life of faith in Christ, while Israel’s Sabbath as a picture, which simply pointed them towards the Person and Work of Christ the Saviour, in Whom they would finally discover eternal rest.